The curve crosses the x-axis at (1, 0), touches it at (–3, 0) and crosses the y-axis at (0, –9). a. In the space below, sketch the curve C with equation y=f(x+2) and state the coordinates of the points where the curve C meets the x-axis. b. Write down an equation of the curve C.
c. Use your answer to part (b) to find the coordinates of the point where the curve C meets the y- axis. We are given sketch of the curve and are required to sketch the graph of the curve . Translation through vector transforms the graph of into the graph of . Transformation of the function into results from translation through vector . Translation through vector represents the move, units in the positive x-direction and units in the positive y-direction. However, for the given case we consider following. Translation through vector represents the move, units in the negative x-direction and units in the y-direction. Translation through vector transforms the function into . Translation through vector transforms the function into which means shift towards left along x-axis. It is evident that we are required to transform the function into , therefore it is case of translation of along negative x-axis by 2 unit. It is also evident from the above table that only x-coordinates of the graph change whereas y- coordinates of the graph will remain unchanged. Hence, the new function has all the y-coordinates same as that of original given function whereas all the x-coordinates are shifted towards negative x-axis of original given function. 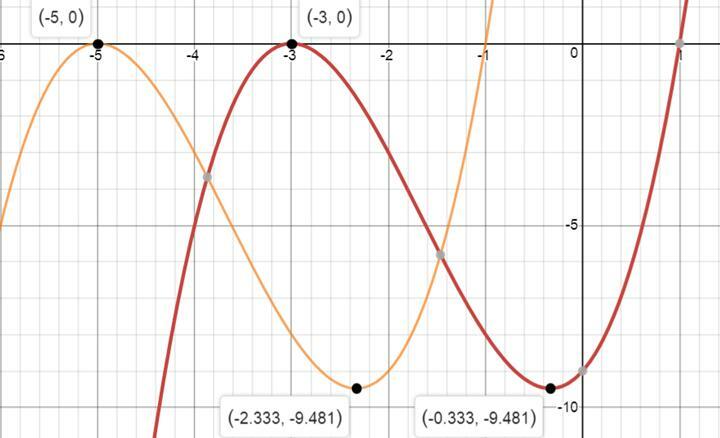 It is shown in the figure below, red one is the original while orange is the transformed graph. We are required to find the coordinates of the point where the curve C meets the y-axis. We are looking for y-intercept of the curve C.
The point at which curve (or line) intercepts y-axis, the value of . So we can find the value of coordinate by substituting in the equation of the curve (or line). Hence, coordinates of y-intercept of the curve C are (0,25).